Danon Platina sister off the mark! Mauritzfontein’s exciting new sire prospect Danon Platina gained a boost to his pedigree page when his three-year-old full-sister Mikki Badeelah got off the mark at Hanshin on Sunday. A daughter of legendary sire Deep Impact, Mikki Badeelah stayed on well to score a neck win in a 1600m for maiden 3yos. The consistent filly has now won or placed in all six of her races, having finished third on her only previous outing in 2019. Sunday’s winner Mikki Badeelah is out of the unraced mare Badeelah, a daughter of Breeders’ Cup Juvenile winner Unbridled’s Song and G1 La Brea Stakes winner Magical Allure. This is also the family of Japanese G1 winner Matsurida Gogh (a ¾ brother to Danon Platina) whose progeny have earned over $36 million. Badeelah’s fourth dam is the outstanding racemare Conniver, the Champion Older Female in the USA for 1948, and a 15 time winner whose victories included such prestigious races as the Brooklyn Handicap and Beldame Stakes. Mikki Badeelah’s full-brother, Danon Platina, was a superb racehorse and the Champion 2YO Colt in Japan for 2014. 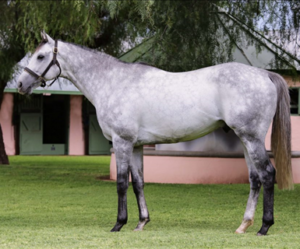 The grey grandson of Sunday Silence is set to commence his stud duties at Mauritzfontein in 2019. NextBoland’s Coup De Grace filly looks quick! libero commodo at non libero. eget amet, sed luctus consequat.